With the summer crush of poker tournaments over, Shortstack and I decided to take a vacation and since I had heard there were some good home games in Israel we booked a BusinessFirst award on Continental and coordinated with Avi "Two Cokes" Freedman, his wife Gail, and brother Noam to travel together. Continental didn't have any saver awards as usual but the premium for the EasyPass award was less than 50 per cent – 200,000 miles per person versus 140,000 – so we cashed in all my Continental and AmEx points along with a few Starpoints and we were in. Although I'd been writing about poker almost exclusively lately we all agreed we would have to do a trip report and Shortstack compiled the details of the adventure and co-wrote this with me, leaving me free to solve the Palestinian-Israeli crisis in my spare time. Photos were taken by Shortstack, Noam, and Gail, or filched off Google Images. Steve "Pluto" Salta, the man who introduced me to the frequent-flyer game, appropriately dropped us at Sea-Tac and offered to pick us up on the return. Shortstack and I were seasoned travelers so there was no reason we couldn't pack a week's worth of summer clothes into our Briggs & Riley carry-ons and avoid checking bags through Customs. We popped briefly into both the Delta Crown Room and the Continental Presidents Club before the flight. 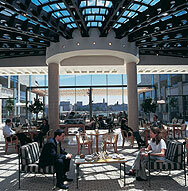 The Crown Room was beautiful but had no free Internet access and was located at the extreme end of Terminal A. The Presidents Club was tiny but had complimentary WiFi. With Continental we never worried about getting to the gate before boarding was called because they had the blue carpet for elites to use at any time. This was a virtually cost-free innovation that all airlines ought to match. We settled into row three of the 737-800 and I played a few hands using my Verizon wireless card before they shut the door. The flight to Newark was uneventful and the food plentiful but mediocre. They started off with yummy hot nuts and finished with Haagen-Dazs sundaes so they made a good first and last impression anyway. The movie was Monster-in-Law, a watchable but predictable mother-in-law comedy with Jennifer Lopez and Jane Fonda. We landed on time in New Jersey and had a beautiful view of the Manhattan skyline on the approach. Our return flight was on Sept. 11 and I felt a lump in my throat as I looked downtown at where the twin towers used to be. We proceeded to the Presidents Club near gate 120 and prepared to argue with them to get Avi, Gail, and Noam in for the three-hour layover we all had. We had lots of ways to gain admission, including the Centurion Card, Alaska Airlines Boardroom membership, and Priority Pass, but in the end we were each allowed two guests simply for flying BusinessFirst so we could have brought in a homeless person off the street in addition to our three friends. Noam and I played a few hands on line and then we all went to Gallagher's for some preflight refreshment. Soon it was boarding time and we crossed the blue carpet into the 777 to Tel Aviv. Shortstack and I had reserved seats 9A and B and the Freedmans had a row to themselves in the front part of Economy. Continental divided the two cabins with a transparent curtain and velvet rope but we waved back at them from time to time through the Continental divide while sipping Champagne (Ch. 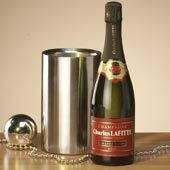 Charles Lafitte, the black sheep of the Lafitte family) and eating the plentiful but mediocre food. The main course came with a nice little Bordeaux. As a rule I don't eat dessert but they had apple pie so I had just one piece with a scoop of Haagen-Dazs vanilla and some drizzled caramel. They had the personal entertainment system on board and we watched the remake of The Longest Yard with Adam Sandler and Burt Reynolds. It was faithful to the original and a good airplane movie. Shortstack caught some shuteye while I played the provided video game Caveman, similar to the old "Chip's Challenge" in the Windows Entertainment Pack. I kept getting eaten by the red wooly mammoth and eventually went to sleep on the flat, but inclined, seat-bed. Before I knew it it was time for breakfast and we were two hours out of Tel Aviv. We landed a little early and breezed through customs and immigration. 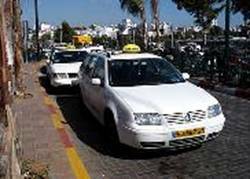 It was hot and sunny and being Saturday, the Jewish Sabbath or Shabbat in Hebrew, there was a limited selection of taxis and we elected to take two sedans rather than wait 15 or 20 minutes to order up a van. 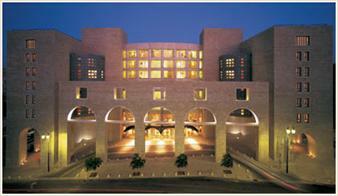 The drivers took us to the Sheraton Tel Aviv Hotel and Towers, where we had booked two rooms using Starpoints. They had a fifth-night-free deal so it was a very good use of the points. We went to check in but they had upgraded us to the Towers so we had a private checkin on the 18th floor where the Executive Lounge was staffed by beautiful young women. We got adjoining rooms on the 19th floor just above the lounge, which was convenient because we could set up one Airport Express and not only share the Internet connection amongst ourselves but also have it available in the lounge. We had arrived just in time for the nice cocktail-hour spread and chowed down in lieu of dinner after our exhausting flight. 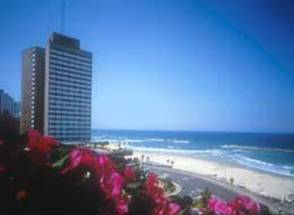 We went for an evening walk along the Tel Aviv beach and then returned to the Executive lounge for complimentary wine and cheese until 11. I folded a 50-shekel note ($11) into the shape of a tuxedo shirt and tipped the very attentive young woman who waited on us all evening, bringing Avi and Noam endless Diet Cokes, and told her we would be there five nights. When the lounge closed we retired to rest up for our first full day in Tel Aviv. 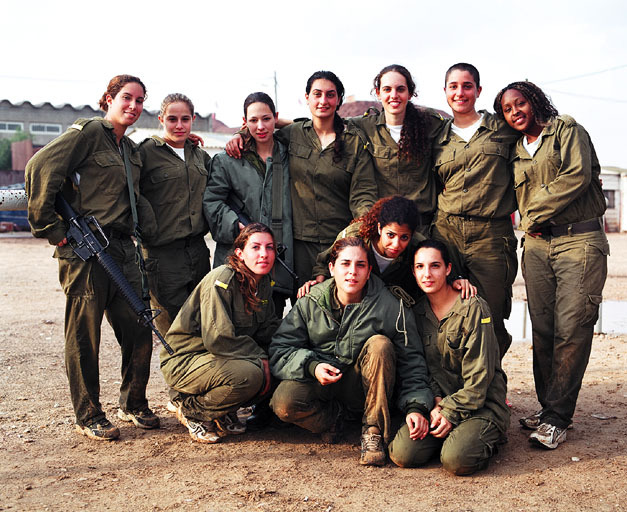 Listen: if you want to understand Israel, you must first understand that there is mandatory military service for all unmarried18-year-old Jews, which lasts three years for the men and two or three for the women and is followed up by reserve duty for the men until at least age 43. During the active-duty period, soldiers carry their weapons with them at all times. In other words, all the 18- and 19-year-old Jewish girls in the whole country are walking around in uniforms carrying Uzis. This is seldom seen in the United States and for some would be worth a trip to the Middle East on this basis alone. Needless to say I was on the lookout for the Uzi girls all week long. Some would call it a fetish but I think I'm just sincerely interested in the workings of national defense. Every hotel in Israel has complimentary breakfast and we had a nice buffet in the Executive Lounge before picking up the Avis six-seater van we had reserved, parking it, and heading on a self-guided walking tour of Tel Aviv. We tried to follow the Orange path but got lost in a market and ended up in the David Intercontinental Hotel schnorring their air conditioning. For lunch Avi Two-Cokes really wanted some shawarma but we all wanted someplace air conditioned as well. This created a conflict and we found ourselves in Dizingoff Center looking for a shawarma place. We passed the ubiquitous McDonalds and Avi joked that they ought to have McShawarma (photo left). Well sure enough they did and he ordered a couple. The rest of us ate at the mediocre cafeteria in the lower level. In the afternoon we continued our walking tour of Tel Aviv, discovering some interesting archaeological remains from the early DOS period (photo right). After the long walk back to the Sheraton we spent the rest of the afternoon camped out in the Executive lounge playing a few hands and chowing down on kosher hors d'oeuvres. Then we met some associates of Avi's for dinner in Herzliya, the Silicon Valley of Israel, at a very nice steakhouse called Odeon. We washed down some very good local filet with the Ch. Golan Cabernet Sauvignon, then walked down to the beautiful beach and listened to the waves wash over the ancient shore before returning to the Sheraton and retiring for the night. Shortstack woke up at 5:30 am and went for an early run on the beach while I prepared mentally for the day. We had breakfast downstairs in the restaurant, still complimentary. Shortstack had arranged for a guide to take us to the outlying areas of Israel for the first four days. The guide she had used in her previous trip 15 years ago was unavailable but recommended another guide named Uri. Uri met us at the Sheraton and we set out a little after 9am in the red Avis Mazda 5 van-thing to drive up the coast. The plan was to drive all the way up to the Lebanese border, then work our way down. On the way, Uri (photo left) told us a bit about himself. He was a paratrooper in the Israeli army until he got shot in the head as a Colonel in the 1973 Yom Kippur War. He spent six months in the hospital and was fortunate enough to sustain only a hearing loss as permanent damage. He has been guiding for 36 years and despite his injury and being excused from his obligation to serve in the military reserves until age 43, he continued to serve until he reached the mandatory retirement age of 54. 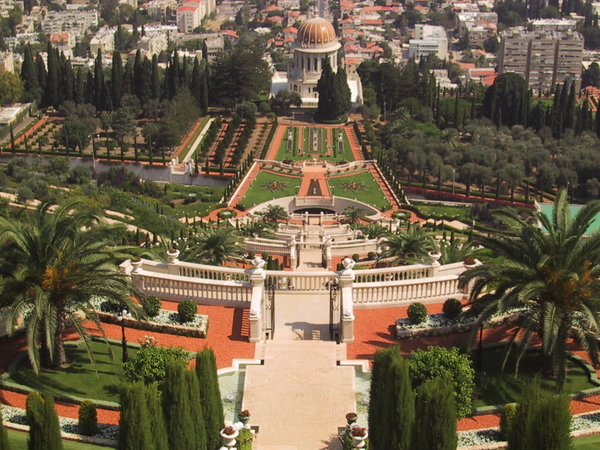 Since it was a longish drive all the way to the top (Israel is the size of New Jersey so it was like we were driving the length of the New Jersey Turnpike), we stopped at Haifa to see the Baha'i Temple and gardens (photo above) to break up the drive. The temple is at the top of Mount Carmel, and although we didn't go in (you have to arrange tours in advance) we looked down into the gorgeous, perfectly manicured gardens. From the top of the mountain there is also a spectacular view of Haifa, and further away, the coastal city of Akko and the hills of Lebanon in the background. I snapped a nice shot (left) of the inexplicably camera-shy Shortstack with the port of Haifa in the background. We continued up to Rosh Hanikra (photo right), a Hebraicized name from an Arabic phrase meaning "head of the caves". This place was at the very top of the country, right at the Lebanese border. The Israelis patrolled the border every hour and there was a gunboat stationed in the bay but this was all very unobtrusive and the attraction was the caves. A short cable car ride down took us to the entrance point, where there were several caves carved out by the pounding of the Mediterranean into the chalk cliff. The chalk is very soft and the water has over time carved its way through. Even on a calm day the waves hit with tremendous force and when the sea was rough it was too dangerous even to go in. The pathways were all slick with seawater and even the safety railings were slippery but this natural treasure was well worth visiting, if only to cool off in the often oppressive Israeli summers. A cafeteria provided a couple of Diet Cokes each for the Freedman brothers and water for the rest of us and we were on our way back south. Our next stop was Akko, a largely Arabic city with a market and a very interesting ancient city wall built by the Crusaders in the 10th-12th centuries. Some of the structures were newer than that at only 400 or so years old, but it wa amazing to see people actually live in or on top of buildings that were built 900 years ago. Shortstack said she'd be worried about falling through the floor. 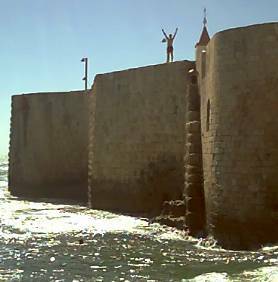 One of the city walls, built into the sea, had kids climbing up the side and jumping off despite the bed of rocks at the base of the wall (photo right). We walked through the Arab market, where they had about 20 different varieties of fresh fish caught in the Mediterranean the same morning at the ruins of what used to be part of the entrance to the port but now is just a fishin' hole. We had lunch in a restaurant in the market and what with the hummus, olives, tahini, pitas, grilled meats, and salads we all ate too much. They accepted MasterCard so that gave us a chance to use our carefully researched zero-percent foreign-exchange card from the Harvard Alumni Association. The best way to pay for things in a foreign country used to be to get cash out of the ATM at 0%, followed by Visa/MasterCard at 1% and American Express at 2%+. However, all the major US banks banded together recently and started charging 3% for everything, making for a mad scramble on the part of frugal travelers to find a better deal, which we did. The HAA MasterCard is offered by a subsidiary of Barclay's Bank and is probably the greatest value I have reaped so far from my Harvard education. Next stop on the way south was Caesarea, an amazing archaeological site where King Herod, responsible for much of the ancient building in Israel, rebuilt a decaying port city entirely in marble and dedicated it to Caesar Augustus more than 2000 years ago. 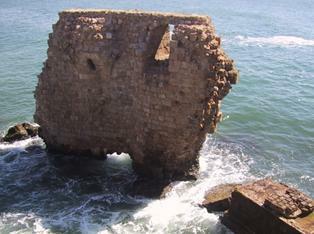 In the 1950s and '60s archaeologists began unearthing the ruins, finding not only the Roman structures but also Crusader fortifications and Byzantine streets. Although only five of the estimated 8000 acres have been unearthed, the findings are remarkable, including two headless life-sized Roman statues. When we were there the Roman amphitheater was being prepared for a dance concert that would seat 4000 people and we stood and watched the dress rehearsal for a little while. It had to be the most beautiful concert venue in the world but in Roman times they had no sound amplification so the sound of the sea might have got in the way. Excavations continue, albeit slowly because of time and cash constraints. 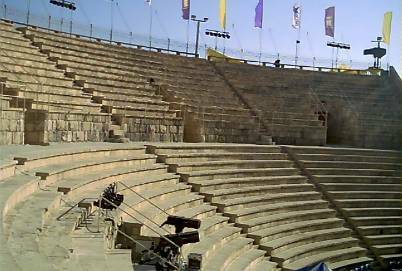 There is a kibbutz that they have moved once already to further the excavation process; currently the kibbutz has banana trees planted over what they believe to be a second, larger amphitheater, and eventually the banana trees will be removed in order to continue the project. The last thing that we saw there was a huge ancient aqueduct built by the Romans that brought a fresh water supply from an amazing 11 miles away at such a precise, gradual slope that if one were to walk on it, the slope would be imperceptible. 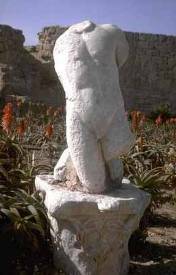 Caesarea also had the distinction of being the location of the only golf course in Israel, and also being one of the most expensive places to own real estate in the country. It was easy to see why. We then headed back to Tel Aviv, dropping Uri at the bus station for his trip back to Jerusalem and battling traffic back to our hotel. We relaxed in the concierge lounge with drinks for a while, trying somewhat unsuccessfully to decide where to have dinner. Avi saw a tapas bar as we were driving back but didn't catch the name so he and Shortstack decided to achieve the dual purpose of getting a quick walk in and scoping out the restaurant situation. The tapas bar was nowhere to be found so Avi grabbed some pre-dinner shawarma and called us to meet at the nearby Yemenite Kitchen, where the chef himself waited on us and insisted that he just bring us a bunch of things of his choice. We ate light and retired for another full day tomorrow. We picked up Uri at the bus station at 8:30 am and headed northeast towards the Sea of Galilee and the Golan. The first interesting place we passed through was a city called Afula, the biggest city in the region and a place where many Arabs live as Israeli citizens. This place is close to Jenin, a hotbed of Arab militants, and is subject to terrorist attacks. Along the way we saw the wall that was being built for security. The wall itself was only about 15 feet high but with high-tech monitoring equipment it would be impossible to cross it without being seen. We passed the important Christian city of Nazareth, where the angel Gabriel told Mary she was pregnant with Jesus, just to the west of the road we were on. We drove past the Sea of Galilee (not really a sea but a lake, also known as Lake Tiberias and in Hebrew, the Kinneret). 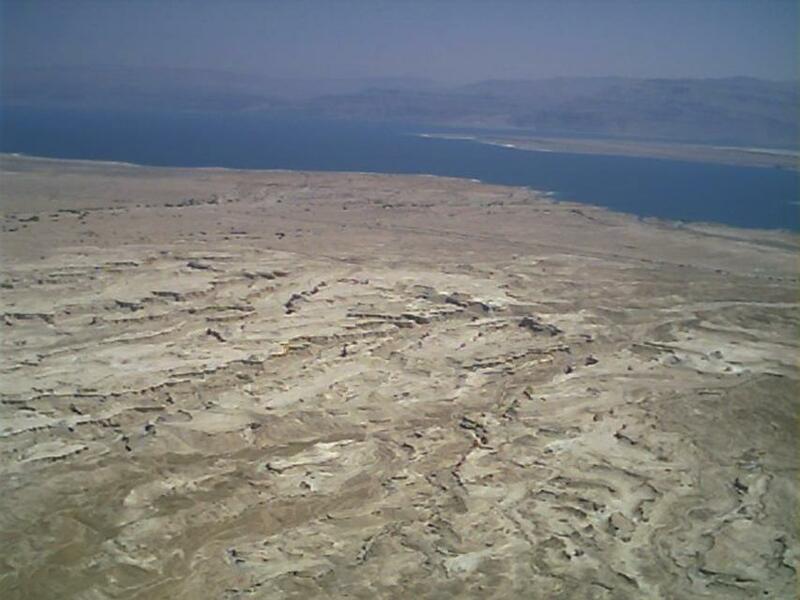 It is the second-lowest point on Earth after the Dead Sea, and Israel's largest freshwater lake. Continuing northeast, we reached the Golan Heights, one of many disputed pieces of land in and around the territory known variously throughout history as Palestine and Israel. While the land has been fought for and disputed many times throughout recorded history, the starting point for an understanding of today's situation is the end of World War I, when the Allies took over territories formerly claimed by the defeated Imperial Germany and Ottoman Empire. After the "war to end all wars," the League of Nations and later the United Nations assigned responsibility for those territories to France (Syria and Lebanon) and Britain (Iraq, Palestine, and Transjordan) with instructions to secure the establishment of a Jewish national home while protecting the civil and religious rights of all inhabitants of Palestine. Under British rule and the League of Nations mandate, 100,000 Jews immigrated to Palestine in the 1920s. This influx began to meet with resistance from Palestinian Arabs and the British began to impose quotas on Jewish immigration. By the late 1930s both the Jews and the Arabs had had enough of the British. Jews fleeing Nazi-controlled Eastern Europe were facing British restrictions on immigration and land purchase in direct violation of the League of Nations mandate and the Arabs perceived the Jewish influx as a threat. In 1936 the Arabs staged an uprising against both the Jews and the British, which the British put down by draconian measures. Soon the world was in the midst of another great war and to their eternal shame, not only the Nazis but also the Allies prevented Jewish immigration to Palestine even in the midst of the Holocaust, when the Nazis and their collaborators killed six million European Jews. Even after the war, the British refused to allow any of the 250,000 Jewish refugees to immigrate to Palestine. The Jewish underground grew stronger as they tried to force the British out of Palestine. The United Nations came up with a plan to partition the British Mandate into two self-governing States, one Jewish and one Arab. By and large the Jews accepted the plan but the Arab leadership rejected it and immediately stepped up Arab attacks on Jewish towns and convoys. On May 14, 1948 the British Mandate expired and the State of Israel declared independence. It was recognized promptly by the United States, Soviet Union, and many other countries. 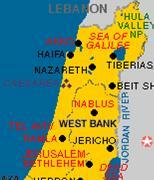 Immediately Israel was invaded by troops from Lebanon, Syria, Iraq, Egypt, Transjordan, Saudi Arabia, and Yemen. Rather than forming their own State, as authorized by the United Nations, the Arabs decided instead to try to destroy the Jewish State. The Israelis won and in 1949 armistice was signed with Egypt, Transjordan, and Syria. 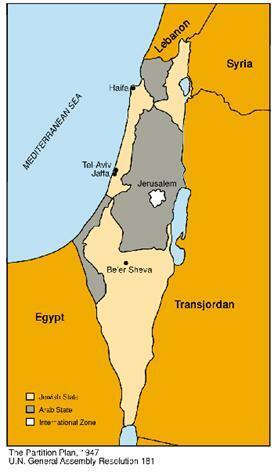 The agreed borders comprised about 50% more territory than the original UN partition plan. About 750,000 Arab refugees were created during this war along with about the same number of Jewish refugees from Arab lands. More than 600,000 of the Jewish refugees immigrated to Israel but the neighboring Arab countries prevented the Arab refugees from immigrating, instead keeping them in refugee camps on the West Bank and Gaza Strip, where they remain to this day. Arabs who remained within Israel's borders were granted citizenship and today Israel is about 20% Arab. Despite the armistice, Israel continued to weather attacks from its neighbors. 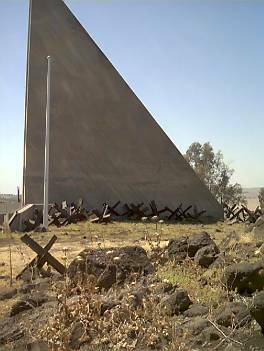 The Golan Heights was used by Syria to shell Israeli civilian targets until 1967, when it was taken by Israel in the Six-Day War. 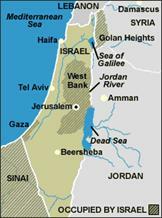 At that time, concerned that the amassing of Syrian and Egyptian military forces along the borders meant a plan to launch a war of annihilation against Israel, Israelis preemptively struck, destroying the Egyptian air force on the ground and taking control of the Gaza Strip, the Sinai Peninsula, the West Bank, and the Golan Heights. In 1973 Syria and Egypt attacked Israel on Yom Kippur, a major Jewish religious observance, in an attempt to recapture the Golan and the Sinai, and Israel quickly emerged victorious once again. In 1978 Israel returned the Sinai to Egypt under the Camp David Accords in exchange for peace and recognition from Egypt. No such agreement has yet been made with Syria and the majority of Arab states still refuse even to recognize Israel's right to exist. Israeli settlements being built in these occupied areas exacerbate tensions and Israel very recently tore down the homes of 9000 settlers in the tiny Gaza strip in acknowledgement that the land belonged to the Palestinian Arabs there who say they want to have their own state there and in the West Bank. Many are skeptical and believe the real goal is to eventually destroy Israel. We stopped in Golan at the Gadot Lookout, where there is a monument to honor the dead Israeli soldiers from various battles, including those that were waged against Syria on that spot. The memorial had around it giant steel anti-tank obstacles shaped like jacks. 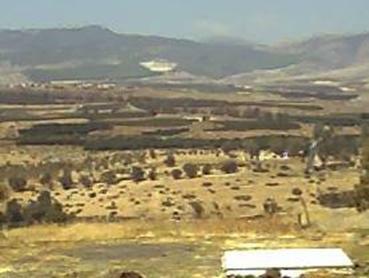 The area that was once Syria is a sharp contrast to the view of Israel: the former Syria (photo foreground) is mostly barren, rocky, full of bunkers and literally thousands of land mines, while Israel (photo background) is green and lush through irrigation. Most of the land mines could not be removed by Israel because they were so old and of such poor quality that even the experts could not remove them without detonation; therefore, there are warning signs and wire fences all over that area to keep people out of the dangerous area. Uri told us about an Egyptian-born spy named Elie Cohn, known as "Our Man in Damascus," who managed to infiltrate the Syrian military. He suggested to them the soldiers hiding in the bunkers shouldn't have to suffer from the heat, so big eucalyptus trees should be planted to provide shade. He then communicated back to Israel that "trees are beautiful", indicating that the bunkers could be found under the eucalyptus trees. Syria couldn't figure out how the Israelis were so accurate in bombing their bunkers. Sadly, Elie Cohn was eventually found out and hanged on the gallows in Damascus. To this day, the Syrian government refuses to return his bones to his family for proper burial. It is common opinion that he was instrumental in Israel winning the Six-Day War. The next stop was Qatsrin, site of a 1900 year-old city and synagogue. There was a small archaeological museum there that we saw along with the ruins. The new city with the same name is now the one urban settlement in the Golan. The Golan Winery was fortunately only a minute away, so we were forced to taste a few very nice wines, and bought a couple half-bottles of the yummy Yarden Botrytis dessert wine, purely to support the economy. Continuing northeast, we had lunch at a Druze village and then continued driving to the most northeastern point in Israel, in view of the Syrian border and only about 35 km from Damascus. Uri pointed out to us an area where during a battle, the Israelis managed to take 92 tanks from the Syrians in just 2.5 hours, learn to operate the foreign equipment in a matter of minutes and use the tanks against the Syrians. At that moment we heard an explosion and, looking to the north, saw several tanks maneuvering on the hillside above us. Uri let us sweat for a few seconds before reassuring us that this was where they practiced. The fairly long drive back was through the beautiful and productive Jordan valley. Israel is fortunate to have many different foods that grow wild, without irrigation - almonds, figs, pomegranates, and olives, to name a few. Amazingly, the country actually supplies all of its own food with the exception only a few items (like grains). This means that almost all of what we ate here was grown in Israel. 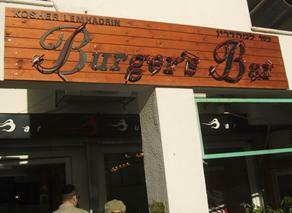 Speaking of food, dinner was at a casual restaurant on the beach in Tel Aviv. As if sitting outside with the fresh sea breezes isn't good enough, we also from time to time get to see a show, like the strange way they tow cars here. A flatbed truck with a huge fork lift on the side will pull up alongside a car, and will keep jabbing the fork underneath the car and attempting to raise the car until the car is properly balanced on the lift (this can happen, say 10 times or so). 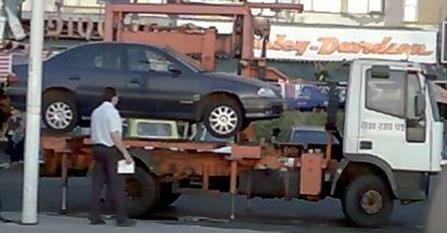 When the driver is satisfied with the car's positioning, it will just hoist the thing in the air and rest it on the bed of the truck, keeping the fork underneath. An odd sign provided a much-needed humor break as we were taking a biological break somewhere along the way, Avi started laughing just outside the men's room. He suggested that he might not be qualified to go in and we might have to get Uri to open the door (see photo). The ladies' sign was of course the normal girl-in-triangle-dress. Our first stop was Masada, a plateau located near the shore of the Dead Sea. The citadel of Masada was built by King Herod, who ruled from 37BC - 4BC. This strategically advantageous location on an isolated mountain was developed not only as a fortress, but also a winter palace; strangely though, Herod never actually visited. Complex water systems were built to catch the rain water from the desert, divert and store it in the mountain so that the inhabitants would have drinking water and water for bathing and steam rooms. The living quarters in the village and of course the palace were considered the ultimate in luxury, with beautiful mosaics on the floors and colorful artistry on the walls. Some of this is still visible today. 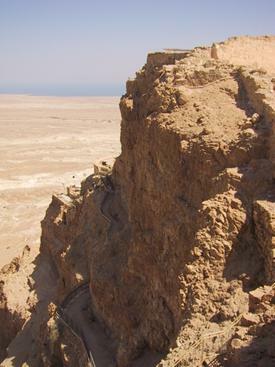 Masada is well known as being the last bastion of Jewish freedom fighters against the Romans in approximately 70AD. As the official Masada pamphlet says, "Its fall signaled the violent destruction of the Kingdom of Judea. 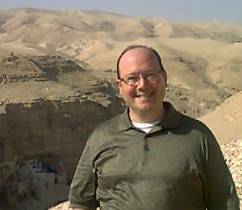 … The tragic events of the last days of the rebels at Masada transformed it into both a Jewish cultural icon and a symbol of humanity's continuous struggle for freedom from oppression." The history is that the 960 Zealots (or rebels in the Great Revolt of the Jews against the Romans) fled to the mountain and were able to hold off the Romans for three years. 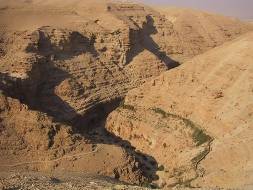 They had excellent food storage structures and the water system that was developed earlier allowed them to have a constant fresh water supply, whereas the Romans had to go many miles away to the desert oasis of Ein Gedi to get their water. 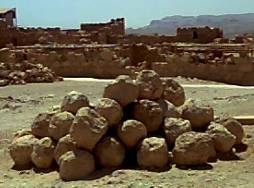 They took the artillery (large rocks) catapulted up by the Romans and rolled them back down the hills, where they bounced and became even more deadly. When it became apparent that the Romans would imminently conquer the rebels, the story is told, the men decided to kill themselves and their wives and children rather than live in slavery under the Romans. They took care to leave their food supplies intact so it would be obvious that they did not die of starvation, but rather by choice. Suicide is rare in Judaism and only 25 skeletons were ever found so no one knows if the story is true. However, 11 mysterious shards of pottery were found in the fireplace with names written on them, one of which was the leader of the rebels. Conjecture is that the shards were lots they drew to see who would have the task of killing the last few men and then himself. Today the Israeli military swears in its soldiers on top of Masada, as it is a place of heroism and inspiration. After a brief stop for Gail and Shortstack to buy Ahava products (excellent skin care products made by the nearby kibbutz from Dead Sea salt and minerals), we stopped at Ein Gedi for a quick lunch. Every time we parked, Uri directed us to find a spot in the shade and it quickly became apparent why: a car left in the sun for an hour built up an interior temperature approaching a kiln. 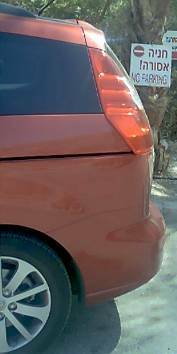 At one point Uri pointed at a shady spot directly in front of a "no parking" sign. I protested that we couldn't park right in front of it but Uri tut-tutted. "You're in Israel now," he said, and we did (photo right). We then continued to the Mineral Beach at the Dead Sea. The Dead Sea is the lowest point on Earth, at 1350 meters below sea level, and like Galilee it is rather small to be called a sea. The salt concentration of this water is around 34%, more than ten times that of any other salt water, making it impossible for anything to live in the sea and also impossible for a swimmer to sink. While Noam and I monitored the beach in lounge chairs to protect against any dangerous girls in bikinis, Shortstack and Gail enjoyed the weird feeling of being able to "sit'" in the water or stick their arms and legs out of the water while floating at the surface effortlessly. Then the girls did the traditional thing of coating themselves with the Dead Sea mud, letting it dry and rinsing it all off, reputedly very good for the skin. Unfortunately the pictures of the girls coated in mud somehow got deleted. At that point we were ready to head back to Jerusalem to meet up with friends of Avi, Gail and Noam's and have dinner at their house. This wonderful family moved to Israel just over two years ago from Passaic, New Jersey, We picked up dinner from a restaurant they owned and shared the long dining-room table with the children, many of whom were theirs. After dinner we played a little Pot-Limit Omaha with Shortstack as the dealer. I was ahead almost 100 shekels until Avi Two-Cokes put a beat on me, cracking my Aces when he flopped two pair with a Six and a Four. Avi and Noam were born to drive here. Even Uri was complimenting them on their ability to throw down the moves on the road (drivers are at least as, and maybe more aggressive than, those in Boston or New York, and the Freedmans take no prisoners). 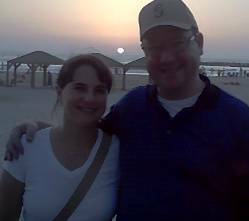 At one point we were passed on the freeway by an Israeli taxi and Noam said, "There he is." "There who is?" I said. "The one person in Israel who drives faster than me." We got safely back to Tel Aviv for our final night in the executive lounge. We checked out of the Sheraton Tel Aviv early, shoehorned our luggage into the red van-thing and fought traffic up to Jerusalem. Just under 2 hours later we arrived at the gorgeous David Citadel hotel (photo right) where we met Uri, were thankfully granted an early check-in, dropped our bags, and rushed out again to start the day's events. Our first stop was the Soreq Cave Nature Reserve in the Judean mountains. This cave, which is full of the world's biggest (and certainly most beautiful) stalactites and stalagmites (photo left) was discovered accidentally in 1968, when routine blasting in the quarry revealed a small opening into this cave, which had been naturally sealed and hidden for thousands of years. It was still very much active and the dripping of water through the calcified rock would continue to make this cave a living treasure. 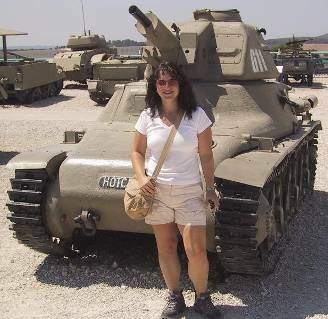 We then continued to Latrun, site of the loss of many Israeli soldiers during the 1948 War of Independence. There we visited the Armed Corps Museum, also known as the Tank Museum, which had a very moving presentation and something like 150 tanks on display. We were assigned a fetching young tank instructor (left) as a guide, who told us that while the tank crew was all male, the instructors were all 18-20-year-old female soldiers. I got lost in thought awhile and had to rush out to keep up with the rest. 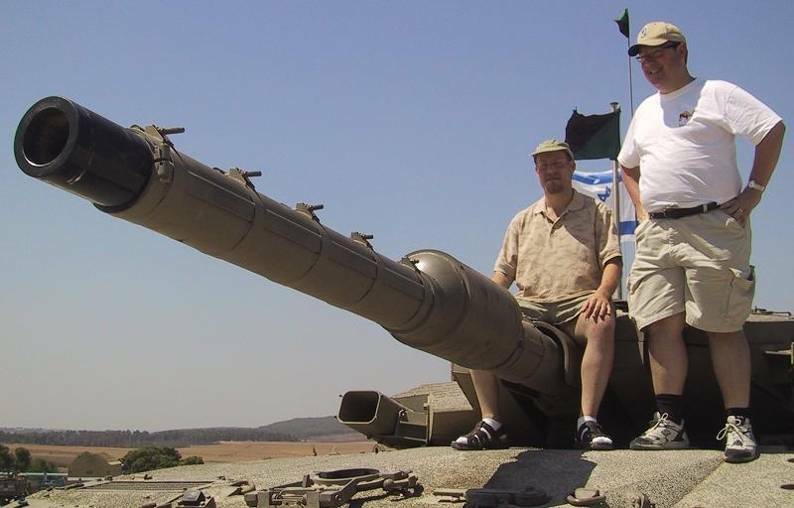 We got to crawl around on an Israeli-made tank called the Merkava (photo above), a 1200 horsepower beast that weighs 63.5 tons and travels up to 90 km/h (there is now a double-secret Merkava IV that is even bigger and more sophisticated). They even had a Shortstack-sized tank for the tank girl who wanted power but not bulk (photo right). Uri used his connections to muscle us into the tour of the Western Wall tunnels (normally you had to reserve your spot pretty far in advance), so that was our next destination. Uri specializes in a packed day and not wasting even one minute of time, so naturally we were a little concerned when a truck decided to pull out in front of us on our way to the Old City, and in trying to turn onto the narrow street, ultimately ended up just blocking the road while he continued to maneuver without really understanding how to drive a truck. After waiting 5 minutes that we didn't have, Uri got out and went to talk to the driver. Two other guys from a car stuck behind us also got out and went to talk to the truck driver (at least we were hoping that's what they were doing -- otherwise they looked pretty menacing). After about another 5 minutes, we saw the same guy again hopping down from the drivers' seat on the truck -- I guess he convinced the bad driver to just hand over the keys and let him back out the truck. Nonetheless, we got there with about 10 seconds to spare. The tunnel tour took us though layers of civilization dating back thousands of years (photo left). Said the tunnel tour guide, "If you're in America, it's a big deal if something is 200 years old. 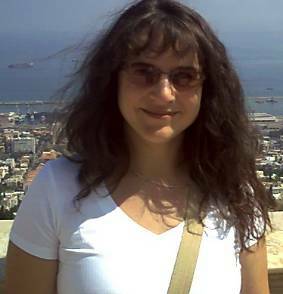 Here in Israel, if something is less than 2000, we don't even bother to talk about it." After the tour we walked through the Old City, noting the Muslim, Christian, Armenian and Jewish quarters. We also saw the Roman Cardo (shopping street, photo right) and the Church of the Holy Sepulcher, where it is claimed that Jesus was crucified and buried. Sitting with Uri for a beer at the outdoor cafe that overlooks the swimming pool and Old City (an absolutely stunning view!) we decided to hire him for our last two days in Israel so we could pack in as much as we possibly could (who needs rest, anyways?). We laughed about the fact that Noam's driving today caused Uri (a former Colonel in the Israeli Army who clearly isn't afraid of much) to want to put on his seat belt -- probably the ultimate sign of respect from an Israeli! Uri told us that when we were at Latrun, a tour guide that he knows came up to him and asked if he had seen the red van-thing on the way there that passed him and a truck over the white line. Uri said innocently "I don't know what you're talking about" and then made himself scarce. Uri also regaled us with stories of the celebrities he has guided, including Frank Sinatra, Shirley MacLaine, and Elizabeth Taylor. Dinner was at the excellent Shonka, one of several non-Kosher restaurants in Jerusalem. This one was recommended by Arnie the Compmeister so we made it a priority. We were all exhausted so we called it an early night. Today we met Uri at our hotel at 8:30. As it was Friday, many things would be closing mid-afternoon in observance of the Sabbath so we had a lot to pack into a short period of time. The Freedmen weren't up for the heavy start to the day so Uri, Shortstack and I headed first to Yad Vashem, the Holocaust memorial and museum, which preserved the history and memory of the six million Jews murdered by the Nazis and their collaborators during World War II. The first thing we saw were trees planted in honor of the heroes who had risked their own lives to save Jews from the death camps, including one for Oskar Schindler of Schindler's List fame (file photo of Schindler and his tree, right). They had added many exhibits since Shortstack had last visited 15 years ago. At the end of the tour we went into the children's memorial (photo left): a very dark room full of mirrors, with faces of murdered children projected on the walls, their names and home towns announced over the speakers, and one single small flame burning in the center of the room. 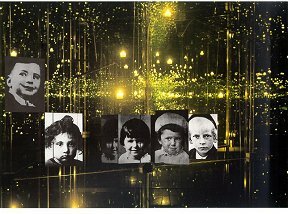 The reflection of the mirrors made the single flame appear as 1.5 million flames, one for each of the 1.5 million children killed. I had a deeply emotional reaction to this museum as I did to the one in Washington, D.C. It is important to support and to visit these sites to remind us that people are capable of such immense evil, and that it must never happen again. To lighten the mood, Uri bent down and picked up a brown leaf shaped like a dried-up banana. "Do you know what this is?" he asked. We did not. He broke the leaf open and took out a small bean. "This is the carob bean," he said. "In Hebrew it is called 'karat.' " He turned to Shortstack. "When your husband buys you a one-carat diamond, this is how much it weighs." The beans are very consistent in their weight independent of size or shape. Historically, the carat was derived from the weight of the carob bean, although in 1914 it was redefined as 1/5 gram. Next we went to the City of David (photo left), outside the walls of the Old City. 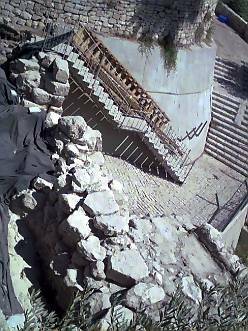 This is an excavation that has been going on for 19 years, and is extremely important because it is said to be the earliest section of Jerusalem where many chapters of the Bible were written (the city dates back at least 3600 years) and from which the city grew and developed over the course of history. One of the interesting things that we learned today is that in 700 BC, in order to divert water coming from the Gihon Springs into the city, a tunnel of 533 meters long was dug by the city inhabitants. 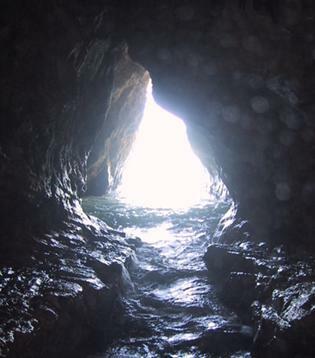 Although workers dug from both ends without modern navigational aids, they were able to get the two tunnels to meet in the middle almost exactly. I was excited when I discovered you could walk through the water tunnel but we had neither time nor proper gear so we resolved to do it next trip. The next sight to squeeze in before 2pm was the new Davidson Center in the Old City, which highlights the new excavations taking place along the southern wall of the Temple Mount. The Temple Mount was a foundation upon which to build the Temple, as its location on Mount Moriah was not flat land. The excavations show that the Temple Mount goes many stories below what appears to be ground level (the level that the Western Wall is found). 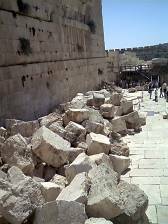 There is a huge pile of bricks that were pushed off the wall when the second Temple was destroyed. The only way to take down these walls was to push bricks off the top one layer at a time, and the fallen bricks were left by the archaeologists in exactly the place they were found (photo right). The final pre-Sabbath stop was the Israel Museum, where the Dead Sea Scrolls are housed. 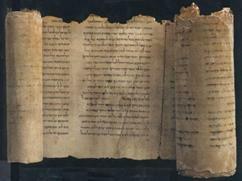 These scrolls, dating back 3400 years, are, unless there's some enormous scam going on, copies of the original Aramaic Bible, and were found by Bedouins in a cave near the Dead Sea in 1947. They were well preserved because they were sealed in jars, protected from air, light and humidity. It was time for lunch, so we whipped over to the Jewish market to watch the fervor in preparing for Sabbath, and to grab a quick but yummy falafel or shawarma in one of the many stands throughout. The last stop of the day was Wadi al Qelt, about seven kilometers from the important and Arab-controlled city of Jericho, with a beautiful view of the Dead Sea. It was a good thing we trusted Uri because this was the kind of place you drove out to when you wanted to kill people and leave them in the desert, never to be found again. 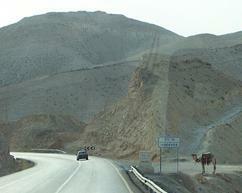 As we drove deeper and deeper into the desert we saw a camel standing on a hill by the side of the road. 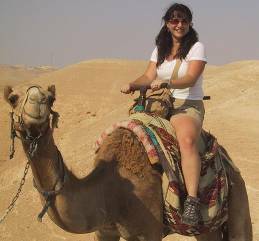 This was Shortstack's chance: she couldn't leave Israel without riding the camel. So we got out of the van and a Bedouin boy appeared. Uri talked to him, we climbed the hill, and Shortstack got on the camel (photo right). Uri threatened to have the camel take her back to Jerusalem, but luckily the camel said no so she was only on for a few minutes. The trickiest part of riding a camel is the dismount (photo above) but Shortstack seemed to take it in stride. Uri asked if any of us wanted to take a little walk in the desert and meet the car up the road so Shortstack, Gail, Avi and I agreed. 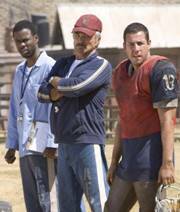 He didn't say we'd be walking up and down hills made of gravel for a mile! When we got to the end and made our way down an embankment we had a spectacular view of a Greek Orthodox monastery built in the 4th century AD, making it approximately 1600 years old (photo left). 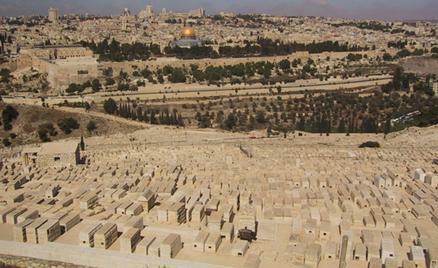 The site that is said to be the place where the First Temptation of Jesus took place can be seen from here as well. This area also has one of three waterfalls in the desert, so despite the fact that "wadi" means "dry river bed," there is indeed water in this area. Uri told us there was a 104-year-old monk living in the monastery who grew his fingernails out like an eagle's talons. He was a very nice man, Uri said, but you didn't look forward to shaking hands with him. The camel didn't smell too bad so we voted to let Shortstack come back in the car with us. We returned to the David Citadel Hotel and the girls took a quick dip in the pool before we all walked back through the Old City to the Western Wall to experience the Sabbath prayers and celebration. The place was packed, mostly with those dressed in traditional Orthodox attire, some with big fur hats, but there were plenty of others including groups of American teenagers soaking in the experience. There were separate parts of the Wall for men and women so Avi, Noam and I made our way up to the front and touched the wall. The men in orthodox garb ranged from the fervently rocking and praying to the schmoozing and socializing ("Raul! Where are you davening tonight?"). Dinner was at Terra, an excellent place within a 10 minute walk from the hotel and of course non-Kosher. Today was still the Sabbath, so many of the sights were closed; however, that was not a problem for us because Uri planned our time in Jerusalem such that we wouldn't miss anything. Today was largely (although not entirely) devoted to Christianity in Jerusalem - it would be almost impossible, or at least a shame, to leave a place with such rich history without getting a taste of more than one culture and perspective. We started with a quick drive up to Mount Scopus, which is the tallest of the mountains of Jerusalem at about 882 m (2750 ft) above sea level. On this mountain are the Hebrew University of Mount Scopus and also the Hadassah Hospital, which was founded in 1928. 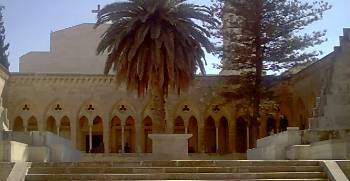 Next were several stops on the Mount of Olives, the first of which was the Convent of Pater Noster. This was built in the 1870s on the site of a Crusader church destroyed by Saladin in 1187, itself built on the site of the original Church of Eleona (Greek for Mount of Olives), which was destroyed by the Persians in 614 AD. 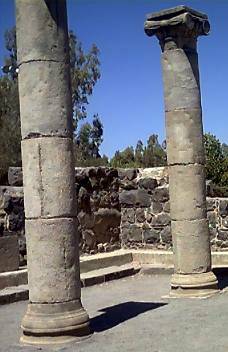 The site is notable because it is said to be the place where Jesus taught his disciples the Lord's Prayer and also where the Roman emperor Constantine first had the vision of the Cross in 312 AD to use as his monogram. Constantine went on to be the first Christian Roman Emperor and built the Church of Eleona as well as the Church of the Holy Sepulcher and the Church of the Nativity in Bethlehem. 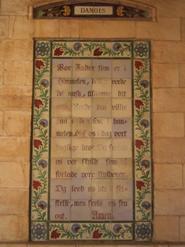 The convent is known for its beautiful plaques of the Lord's Prayer in 110 languages (Lord's Prayer in Danish, right). We then drove for about 1 minute down a steep road to the Church of Dominus Flevit, which means "The Lord Wept" because it is said to be the place where Jesus looked across the Kidron Valley at Jerusalem and wept for it. The church itself was built more recently, on the site of a 5th Century building. Shortstack loved this place because not only did they make her put on a skirt, which she kept in her bag to whip out for such purposes, but the guys, who were wearing shorts, also had to cover our legs! 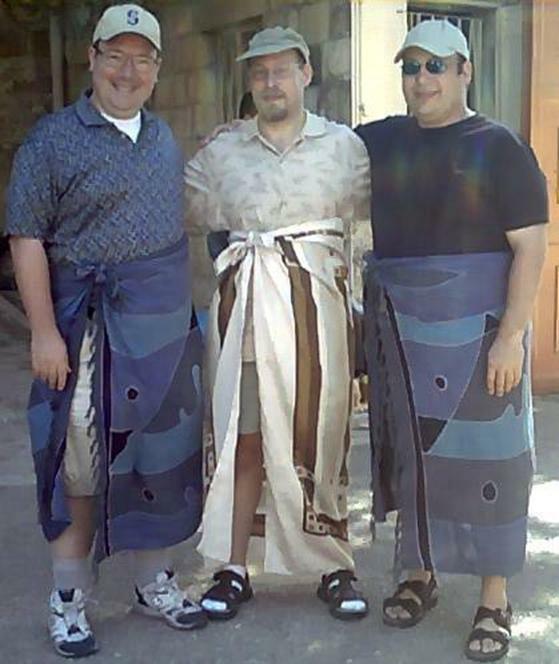 The gatekeeper/hawker of cheap bookmark souvenirs conveniently had three big sarongs, which he matched so that our skirts would be color –coordinated (photo above). We then walked downhill to the Garden of Gethsemane, where Jesus got the "kiss of death" from Judas. 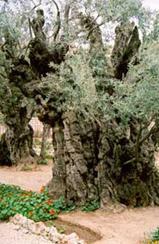 The olive trees in the garden were only 800 or 900 years old (photo left). 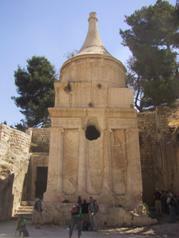 Our walk continued to the Tomb of Mary, located in what is now a 4th century Greek Orthodox church. Continuing down into the Kidron Valley, between Mount of Olives and Mount Moriah (where the Old City of Jerusalem is located), we saw the ancient tombs of both Absalom (son of King David) and Zachariah (prophet). The Jewish religion holds that the body itself is of lesser importance than the soul; therefore in these days, the tombs were large in order to honor the soul. Both tombs were chiseled out of the mountain and carved from one huge stone. The tomb of Absalom (photo right) used to have an outstretched hand rising up from the top but it was inexplicably destroyed by Napoleon. We then walked up to Mount Zion, where we went to King David's tomb. King David had already been resting here for approximately 1000 years when Jesus and the Disciples had the Last Supper at the inn on the second floor of this same building. We continued in the Old City to the Citadel of David, just inside the Jaffa gate. The Citadel was originally built by Herod, who ruled in the 1st century BC, but was destroyed and later rebuilt by the Ottomans (Turks) in the 14th century. Inside the Citadel is the Jerusalem museum, which shows a fascinating microcosm of Jerusalem's history. After lunch in the Armenian Quarter, we shoved our way through the very crowded Arab market as we counted down the 14 Stations of the Cross. A side trip of this countdown was a descent into an ancient water cistern, one of an amazing 42 to be found in the city. We shoved our way out of the Damascus Gate, the busiest and perhaps nicest gate of the Old City, and walked to the Garden Tomb. This is the place that some people believe to be where Jesus was crucified and buried, as opposed to the Holy Sepulcher that we saw a few days ago. 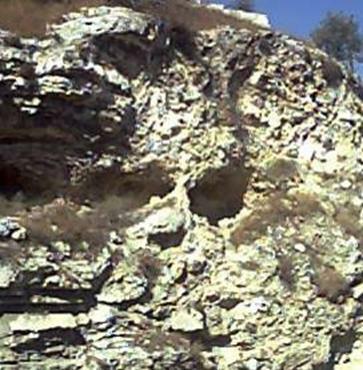 The Garden Tomb area includes both the tomb and the skull-shaped hill, or Golgotha, which symbolizes death (photo left). Earlier in the day we noticed Uri was carrying his handgun. We asked him if he carried it all the time, which he doesn't. We had a brief discussion on weapons, since there were so many of them carried in plain sight by soldiers and people in civilian clothes all over Jerusalem. We had been escorted a few times now by people carrying weapons, notably at the end of the Western Wall Tunnel Tour. Arabs are not allowed to carry weapons. There is very strict licensing and regulation for those that may carry weapons, and as Uri explained, if he does not carry his license when he carries his weapon, his weapon and license will be taken away and he will not get either one back again. While this is of course a very serious subject, we had some levity around it as we were returning to the hotel today. The security point for our parking garage seemed to be having a longer than usual Hebrew conversation with Uri. As we were passing through, we asked him what it was about, and he said that the guard asked if we had any firearms and he said no. Shortstack said "but you do have one" and he said "no, they asked if you had any firearms!" We said our regretful goodbyes to our new friend Uri in the hotel lobby. Despite seven packed days here in Israel, we had seen only a fraction of what there was to see and learned only a fraction of what there was to learn here. This is one of the most amazing places on the planet, if for the depth of the history alone. But as if that weren't enough, Israel is filled with people who make a choice every day to live here and stand up for what they believe in. The Israeli Jews are fighting, in spirit or perhaps in body, for a country they can call home, so that something like the Holocaust can never happen again. But there are also thousands upon thousands of Muslims, Christians, and others standing up for what they believe in, and they are all ingredients in the passionate melting pot of this country. 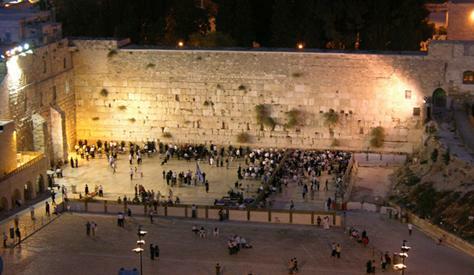 King David named his city Jerusalem, meaning "City of Peace." Maybe one day there will be peace here. Sunday was the 11th of September, one of the few days on the calendar when the memory of violence in America overshadowed the unrest in this part of the world. We had settled up the night before with the David Citadel and got an early start to return the van-thing at Ben Gurion airport prior to checking in for our return flight on Continental. There were no surprises at Avis and we had no wait at the priority check-in line. The Israeli philosophy of security is to have a conversation with everyone rather than randomly search bags of grandmothers. They chatted with us for a few minutes and before we knew it we were in the lounge. This time there were no guests allowed for the BusinessFirst passengers but we got two in on our PriorityPass cards and paid $20 for the fifth person. The lounge was crowded but comfortable and had Internet. We boarded on the blue carpet and had an uneventful but long flight back to Newark, where Avi Two-Cokes and Gail raced off to catch the train to Philadelphia and Noam, Shortstack and I enjoyed the Presidents Club briefly, our connection much shorter this time. The flight to Seattle was a blink of the eye by comparison and we were soon home thanks to VIP pickup service from Steve, who got an earful of gushing about our trip. If you're going to Israel I recommend you hire Uri to guide you. His email is dalits5@walla.co.il or you can call him at +972-522600750.